Jim Steed is the man with the voice. An award winning singer-songwriter and dynamic live performer, Jim has showcased his own brand of original pop/rock music to tens of thousands of people. "It's all about getting the music across and connecting with the audience," says Jim. He shares his passion for music with all who experience his performances. From hi-wattage concerts in arenas to intimate clubs armed only with his acoustic guitar, Jim's unique musical gifts have won over any size audience for over two decades. Jim's first CD "Til I Found You" was featured on dozens of music sites all over the world to great reviews and popular support. He has been a featured artist on AOL.com as well as Tonos.com. 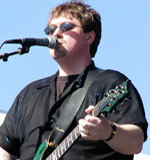 The song, "Til I Found You" (co-written and produced by Emmy-winning composer Michael Whalen) was chosen for the Tonos/Songs of Love 2001 songwriter of the year award. His music has been featured on WUSA television, WRQX radio, as well as several well-known regional commercials. He is also much in demand session singer and musician, having performed on hundreds of jingle, CD, television and advertising sessions. Jim has composed music for short films written and directed by comedian and radio personality Chip Franklin that have been screened to enthusiastic crowds at the 48-hour Film Festivals in Washington, DC and Baltimore. His 2007 release "Fall," was also well received and featured on music sites all over the world, and received radio airplay in the US and Canada. Jim previously performed with the Jack Diamond-Jim Steed Band, featuring Jim and his musical partner Jack Diamond from the Jack Diamond Morning Show formerly heard on Mix 107.3 in Washington DC. In addition to the band, they performed as an acoustic trio, the Diamond & Steed trio, with Jack, Jim, and Jack's wife Lisa. The band has opened for dozens of national acts over the years, and performed hundreds of shows. Jim is a veteran performer, currently playing solo acoustic shows as well as shows with the Jim Steed Band and Diamond Alley.